UVA fans are encouraged to wear orange and blue on Friday, Sept. 2 to support Paint the Town Orange. 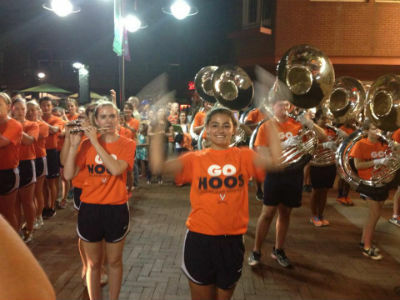 The annual Paint the Town Orange Pep Rally will be held that night at the Charlottesville Downtown Pavilion at 8:30 p.m. The Virginia football team plays its first home game of the 2016 season on Saturday, Sept. 3 at Scott Stadium against Richmond. Kickoff is set for 3:30 p.m. The Cavalier spirit squads will be on the Downtown Mall starting at 6 p.m. on Friday greeting fans and distributing promotional items. The Cavalier Marching Band will begin its procession from the west end of the Downtown Mall to the pavilion at approximately 8:15 p.m. The pep rally will start at approximately 8:30 p.m.with appearances by head football coach Bronco Mendenahll and members of the Virginia football team. The Charlottesville Downtown Business Association invites the public to City Space (100 5th Street) in the Market Street Parking Garage starting at 5:30 p.m. The space will stay open for fans to watch the marching band and complimentary promotional items and refreshments will be available. Paint the Town Orange has been held for more than 25 years and is done in conjunction with College Colors Day as fans across the country are encouraged to wear apparel of their favorite college team to celebrate the start of another season.